Designed and manufactured by Mistral, the Combi Standard CC3 is a highly reliable oil boiler that comes with a 2 year warranty on the burner and 5 years on the heat exchanger. An output of 26-35kW make this unit perfect for homes with more than 1 bathroom and a flow rate of 17.5 liters per minute will ensure it can meet demand for hot water. Should your home need a different output, other models are available, offering output ratings of 15-20 kW, 20-26kW and 35-41 kW.This is a highly efficient unit, as shown by the efficiency rating of 93%, which means that it will be able to save you money on your heating bills. Featuring a multi-directional flue outlet, you can have full flexibility when it comes to finding a place to install this Mistral boiler. 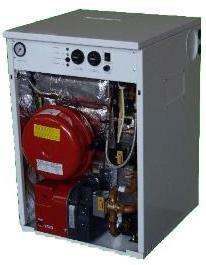 In fact, it can be installed, outdoors, indoors or in a boiler house, the choice is yours. In addition to this, it has a pre-punched access point, can be used in a tandem operation and comes with frost stat fitted for year-round protection from even the coldest weather. Additional weather protection comes in the form of a zinc phosphated casing, also making the unit resistant to corrosion. Plus, the cabinet it completely lockable for added protection.